ABSGroup :: Why Geothermal Engineering & Modeling Important? Why Geothermal Engineering & Modeling Important? Energy & Power > Why Geothermal Engineering & Modeling Important? Automobile engine are often cooled by passing a liquid called engine coolant through the engine block, where it is heated, then through the radiator itself where it loses heat to the atmosphere, and then back to the engine in a closed loop. The radiator transfers the heat from the fluid inside to the air outside, thereby cooling the fluid, which in turn cools the engine. Engine coolant is usually water-based, but may also be oil. More commonly a mixture of water and antifreeze in proportions appropriate to the climate. Antifreeze itself is usually ethylene glycol or propylene glycol (with a small amount of corrosion inhibitor). It is common to employ a water pump to force the engine coolant to circulate, and also for an axial fan to force air through the radiator. When it comes to building, the building is like an automotive engine which produces heat in summer during cooling process and geothermal is like a radiator to transfer heat from coolant (thermal fluid) to earth instead of air. So geothermal field is nothing but a buried heat exchanger use earth mass to reject heat in summer and extract heat in winter to heat the building. To determine proper size of the geothermal field we need to perform engineering and modeling. The design of any commercial building HVAC system requires a licensed professional engineer and must be done according to all other aspects of the building as a system. Geothermal is no exception. One of the most frequent problems encountered with Geothermal engineering and modeling is improper building thermal loads.. Rigorous building load calculation procedures should be used in the geothermal modeling; rules of thumb should never serve for sizing purposes. ASHRAE has established one of the most widely known and accepted standards for the determination of design heating and cooling loads. CSA standard CAN/CSA-C448.1-02 recommends using the ASHRAE heating and cooling load methods. Evaluating the building loads adequately is the initial stage and one of the most important steps in Geothermal project. Why Ground Thermal Characteristics so important? Sizing the Geothermal Reservoir for closed-loop systems also involves greater uncertainty because of the uncertainty of soil conditions. A site analysis to determine the thermal conductivity and other heat-transfer properties of the local soil may be required. This should be the responsibility of the designing professional because it can significantly affect the final design. 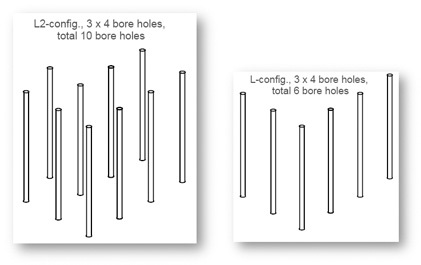 If vertical Geothermal Reservoir are to be used, it is strongly recommended that a Thermal Response Test is undertaken on the first test borehole to give accurate inputs for the local geology, so that the borehole array can then be correctly sized for that location. Also CSA standard CAN/CSA-C448 Series-02 with regard to Geothermal Reservoir design and installation should be consulted when analyzing a potential project. Why is Thermal Balance so important? When a building’s cooling load differs significantly from its heating load, the earth connection will always have either a significant net energy gain or a significant energy loss. This is what is called “thermal imbalance.” In the first case (energy gain), the average ground temperature may start warming up over the years if the Geothermal Reservoir was not properly designed (e.g., ground with low water movement and closely packed boreholes). In the second case, the average ground temperature will gradually fall. When designing a Geothermal Reservoir X, thermal imbalance must always be considered in the final design to insure that long-term performances will be maintained. Long-term Geothermal Reservoir performance can be influenced by the amount of energy rejected in the cooling mode compared to that in the heating mode. If a large imbalance exists in these annual values, it can reduce Geothermal Reservoir performance, and its design should take this into consideration. To evaluate the energy extracted and rejected to the ground, an annual energy-use calculation is required. For a commercial building, this type of calculation can rarely, if ever, be performed manually to obtain a reliable estimate. There are a few simplified methods that are still used today to obtain ballpark figures, but these should be treated with caution given their extremely simplistic approach to commercial building energy use. Energy calculations can be done using Hour-by-hour method: This is one of the most advanced methods for performing annual energy use calculations. It is arguably the best, but most complex method to select. Many commercial programs are available for performing hourly simulation, one of the better known being Carrier HAP. Care must be taken when performing a detailed hourly simulation. Easy to use software interfaces must not preclude a thorough validation of the input data and verification of the outputs. Validity of the results, even with the best hourly simulation model, will depend to a greater extent on its adequate use rather than on its various capabilities. 1. 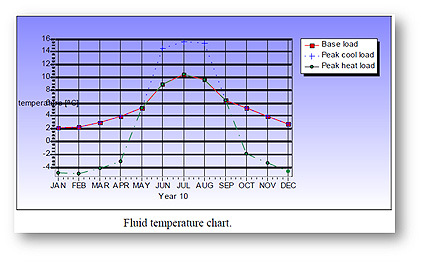 Determine local design conditions and climatic and soil thermal characteristics. 2. Determine building heating and cooling loads at design conditions. 3. 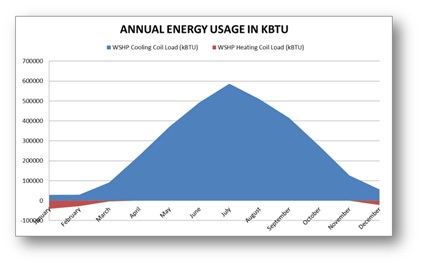 Determine the monthly and annual building heating and cooling energy requirements. 4. Make a preliminary selection of a Geothermal Reservoir system type. 5. Determine a preliminary design of the Geothermal Reservoir system. 6. 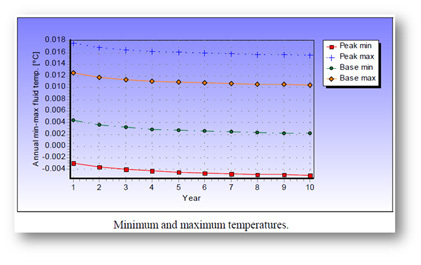 Determine the thermal resistance of the Geothermal Reservoir system. 7. Determine the required length of the Geothermal Reservoir system; recalculate the entering and exiting water temperatures on the basis of system loads and the Geothermal Reservoir system design. 8. Redesign the Geothermal Reservoir system as required to balance the requirements of the system load (heating and cooling) with the effectiveness of the system. Note that designing and sizing the system for one season (such as cooling) will impact its effectiveness and ability to meet system load requirements during the other season (such as heating). 9. Perform a life-cycle cost analysis on the system design (or system design alternatives).